What did I accomplish on Saturday? Let's start with what I didn't accomplish. I didn't take down the pool. I know, I know, that was my #1 priority. I had estimated that there were 500 gallons left in the pool so that when I filled up the 500 gallon water tank which feeds my nephew's bathroom, I would have an empty pool. It took 2 1/2 hours to fill up the tank and when I looked in the pool, there was still approximately 3" left. If I had done a little math beforehand, I would have found out that there was over 1,000 gallons left in the pool. So, I didn't need to take down the pool yet because it wasn't going to blow away in the wind. 3" of water is plenty heavy to weigh it down. My next free weekend I will fill up my 400 gallon tank which is half empty and then move my 300 gallon tank to a shadier spot and put the rest of the water in there. Then I will take the pool down. The good news is that I have more water than I thought so we shouldn't have any problem making the water last until the end of the school year in May. 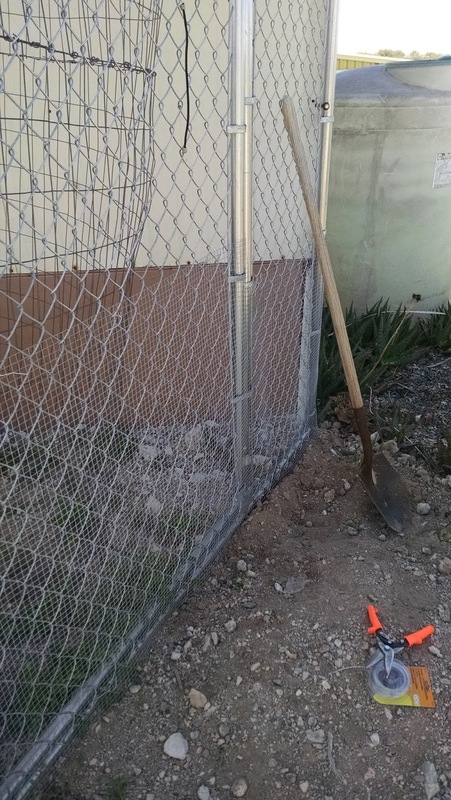 While I was waiting for the 500 gallon tank to fill, I worked on the snake-deterrent fence. The 1/2 inch hardware cloth is rough to work with. 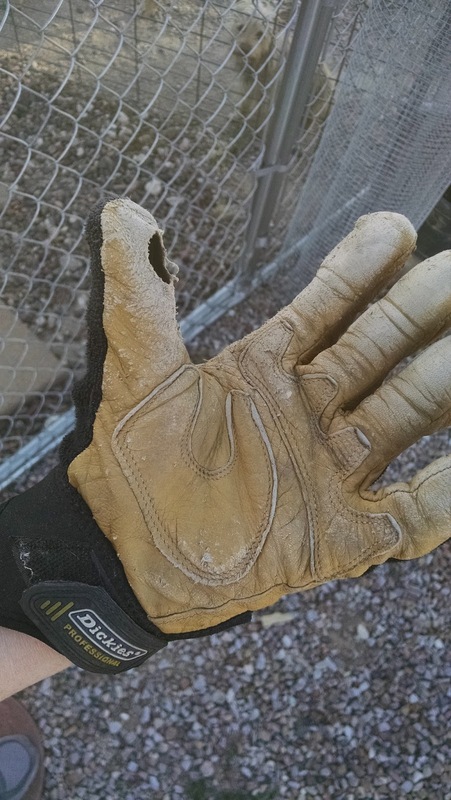 My thumb was getting sore and I couldn't figure out why until I looked at my glove. I was very surprised to see a hole. These were my favorite gloves, inherited from my Dad. He even wrote his name on them when Alzheimer's disease made him paranoid that people were taking his stuff. Oh well, time to get new ones. I finished most of the perimeter but I have another 2 hours of work near the main entrance. I couldn't find my wire cutters but I did have tin snips and they worked even better. 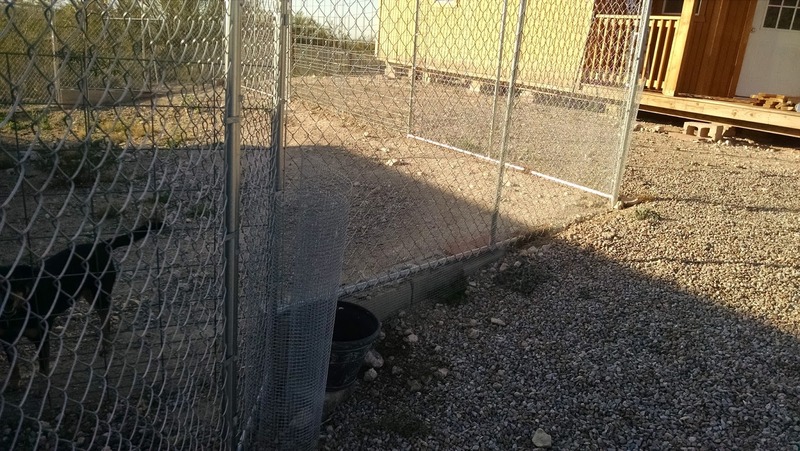 Still, digging, cutting, tying little metal ties was tedious work and it was over 80 degrees. I had to stop at noon and went back out at 3pm when it wasn't as hot. I know half of the country is freezing right now. 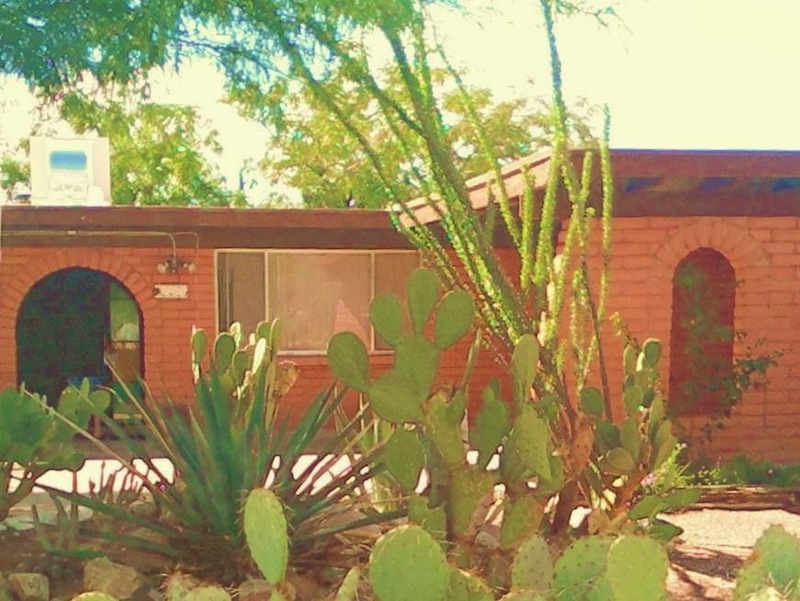 We, Arizonans, didn't mean to steal all of your heat. 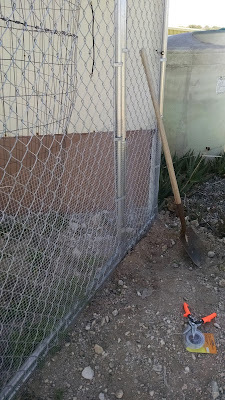 Here's the other gate that I finished. 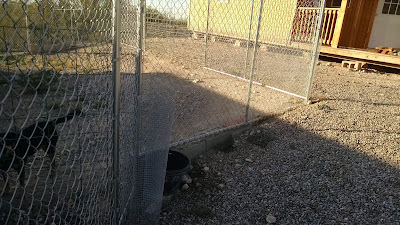 I was more worried about this side because it is close to the open area under the mobile home and I have seen a snake on this side before (years ago, but still). It feels great to have made a lot of progress on a chore that has been hanging over my head for almost a year now. I hope to finish it soon and move on to other things. It was a fun to be able to work on chores around the mobile home. I look forward to the day when the house in town is sold and I have money to work on big projects out here again. You just such easy weekends!! Your activity levels put the rest of us to shame! I... worked over the weekend. But that consists of about 80 emails (max) each day over the course of 12 hours. Right around the corner! OK, not really. Only 2 states away though. 80 emails. Ugh. I hope you were paid well! I was only paid in stares from my dogs as they wondered what I was doing. why don't you get another pair of gloves to wear, but put your dad's gloves in a drawer!!! With all the cold and snow here in NY, a pool party sounds really nice! Just don't invite the snakes or scorpions LOL! Oh, anonymous, you are encouraging my pack rat tendencies. Lol. Actually, my dad would have just wrapped some duct tape around the thumb and carried on. 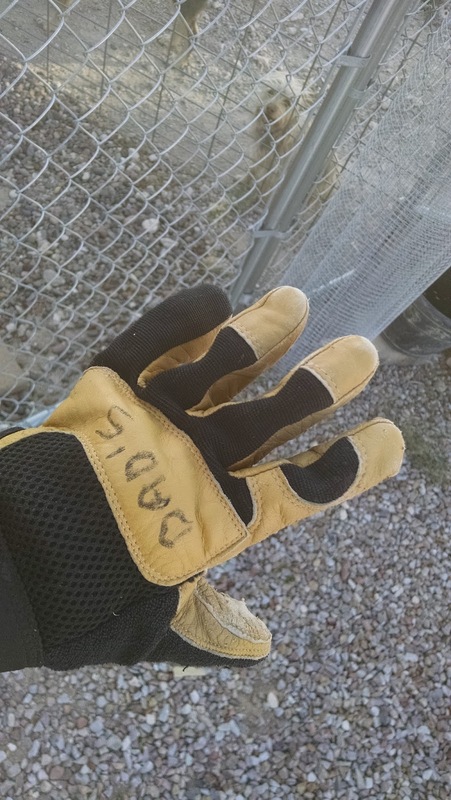 I will probably keep them as backup gloves. Only 3 inches of water left in the pool. Not quite enough to float. The snakes might crash the party since it is still in the 80's here. Haven't seen any yet though.